With its distinctive white aerodynamic body and rotor arms and fixed landing gear, the DJI Phantom Quadcopter is probably the most recognizable drone on the market. And as the latest in the series, the Phantom 4 has some highly desirable features for the pilot, including front facing obstacle avoidance sensors and GPS based navigation. Besides being able to view footage streamed to your smart device linked to the wireless controller from up to 3.1 miles, the Phantom 4 has two downward facing sensors that allows you to follow moving subjects automatically. The stabilized 4K camera, incidentally, is mounted on a 3-axis gimbal slung underneath. Like the plethora of action cams hitting the market, the Phantom’s camera is a relatively simple module, however, with a 20mm equivalent (94 degree FOV) f2.8 fixed focus lens mounted in front of a 12-Mpix 1/2.3” CMOS. While the standout feature is 4K video with the option between DCI and UHD resolutions and high frame rate 1080p, it can also take 12-MP stills in RAW (DNG) or JPEG, making it an attractive option for videographers and photographers alike. Although the camera is versatile, that fact that it is a small and lightweight stripped down module that permits up to a 28-minute flight time (depending on the use of GPS) along with a top speed of over 44 mph. The drone itself is also relatively portable during transport. It measures 350mm across and weighs 3.0 lb / 1400g, body only (with battery and card). 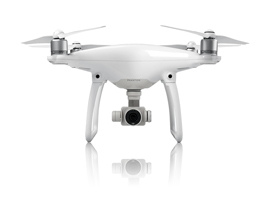 The DJI Phantom 4 is available now at around $1,199 (USD). 20mm equivalent F2.8 fixed focal length lens with 94 degree FOV. 4K UD video at 30 fps. Full HD up to 120fps. DNG RAW or JPEG capture. Live view with smartphone or tablet. 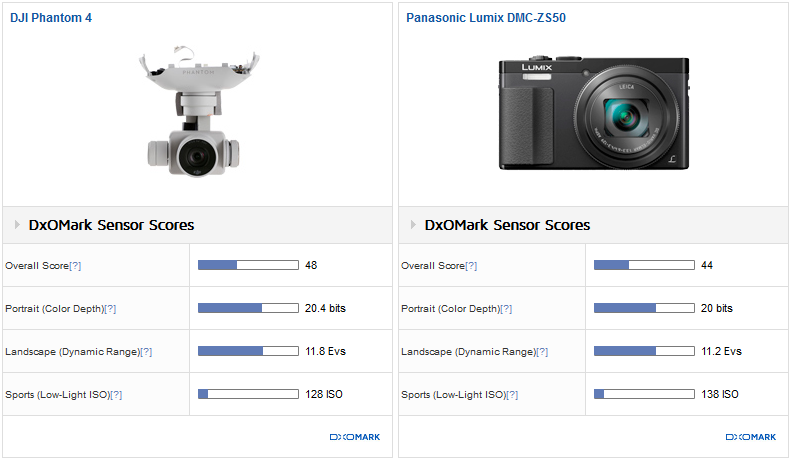 With an overall DxOMark score of 48 points the sensor performance for stills is, perhaps unsurprisingly, similar to compact cameras using the same resolution and size 1/2.3” type CMOS sensor from a few years ago. Overall performance is close to the sensor in the Pentax Q10 and Canon PowerShot SX50, both introduced late 2012, as well as the Panasonic Lumix DMC-ZS50 model from 2015, but it’s unlikely they’re related sensors. The Phantom 4 sensor achieved a good Portrait (Color Depth) score of 20.4 bits at base ISO and with that a pretty decent Landscape (Dynamic range) score of 11.8EVs. However, like others this size, with a Sports score of just 128 ISO (the highest ISO value that delivers what we consider to be still of excellent image quality – that is a minimum SNR of 30dB with at least 9 EV dynamic range and 18 bit of color sensitivity), the small sensor’s limitations are clearly shown in low-light levels. While the 4K capable 12-MPix 1/2.3” CMOS sensor is widely used in action cams and drones, the camera marques have mostly adopted higher resolution 16-20-Mpix 1/2.3 sensors in compacts, concentrating on stills and offering less ambitious 1080/30p video instead. However, we have one still current compact in our database that can offer some insight into stills performance at least. Introduced in 2015, the Panasonic Lumix DMC-ZS50 is the most recent camera model in our database with a 12-MPix 1/2.3” CMOS. It similarly eschews 4K video, however, concentrating on stills instead. The Phantom 4’s sensor does rather well in performance terms against the DMC-ZS50, despite the former having lower signal to noise ratio (higher noise levels) at every ISO setting. That said, the Phantom 4 drone camera has slightly higher color sensitivity at base from lower color noise as well as a wider dynamic range, though it is the result of a lower base ISO in both cases. From ISO100 onwards, the two models perform similarly in dynamic range and color sensitivity. As this is the first drone that we’ve tested in our lab we’ve little to compare it with directly, even though 1/2.3” inch sensors are still being adopted by compact cameras (albeit with less enticing video capabilities). Of course, drone photographers aren’t any different to other photographers and the 12-Mpix CMOS sensor in the Phantom 4 is quite impressive with regards to dynamic range and color sensitivity, particularly at base. Both are useful characteristics to have for landscapes, especially the dynamic range, where additional control over exposure is never a bad thing. Cityscapes taken during the golden hour may prove slightly more challenging for the Phantom. Its low-light capabilities are on a par far this size sensor but are well behind the results we see from larger sensors. Nevertheless, whether you’re taking your first steps into drone photography or you’re looking for something to supplement an existing setup, on balance the Phantom 4 look tempting.